NANJING, China (AP) — Kento Momota of Japan defeated Shi Yuqi of China 21-11, 21-13 in the men’s final at the badminton world championships on Sunday. 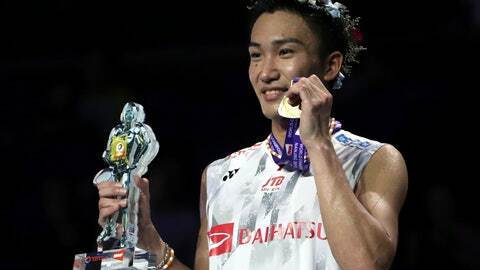 Momota won the final eight points of the opening game and used a combination of precision striking and finesse in the second to claim his first world title and Japan’s first men’s singles crown. Momota has won nine of 13 tournaments he has entered since returning from a 15-month gambling-related suspension that caused him to miss the Rio de Janeiro Olympics. He also beat Shi in the final of the Asian Championships in April. In women’s singles, Carolina Marin of Spain defeated India’s Pusarla Sindhu 21-19, 21-10 for her third world title. Marin fell behind 14-9 in the first game before taking control with an aggressive style and high pace. She continued to attack in the second game and opened an 11-2 lead before easing to her first world championship since 2015. “I don’t think that my tactics were very good, but I won the gold medal because I did a lot of preparation,” Marin said. It was the second consecutive world silver medal for Sindhu, who also lost to Marin in the Rio Olympic final. Japan’s Mayu Matsumoto and Wakana Nagahara won their first women’s doubles world title by upsetting second-seeded compatriots Yuki Fukushima and Sayaka Hirota 19-21, 21-19, 22-20. Matsumoto and Nagahara rallied from an 18-13 deficit in the final game for their first victory in four all-time meetings between the pairs. In men’s doubles, China’s Li Junhui and Liu Yuchen beat Takeshi Kamura and Keigo Sonoda of Japan 21-12, 21-19 for their first world title. Top-seeded Zheng Siwei and Huang Yaqiong beating Wang Yilu and Huang Dongping 21-17, 21-19 in an all-China mixed doubles final.